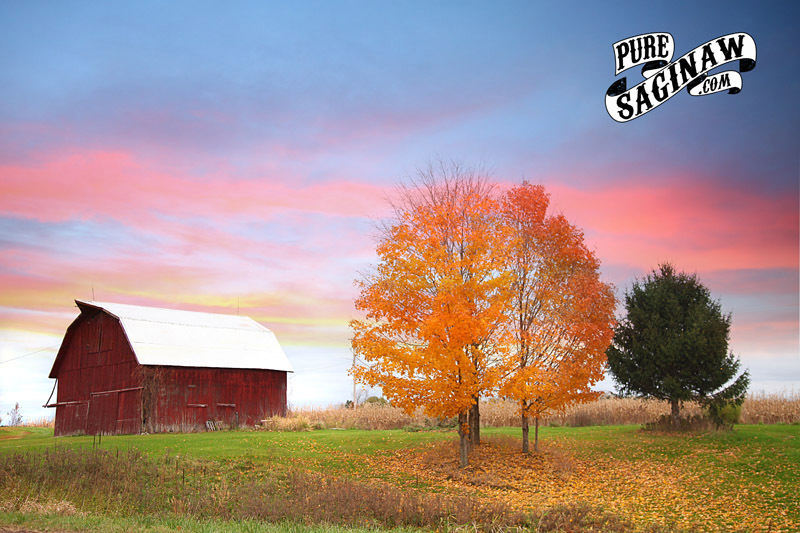 I saw this old barn near Brant back when we had colorful leaves on the trees. I am not sure why I forgot to post it but I am now. I figure its a nice pic since it’s been so gray and gloomy lately. 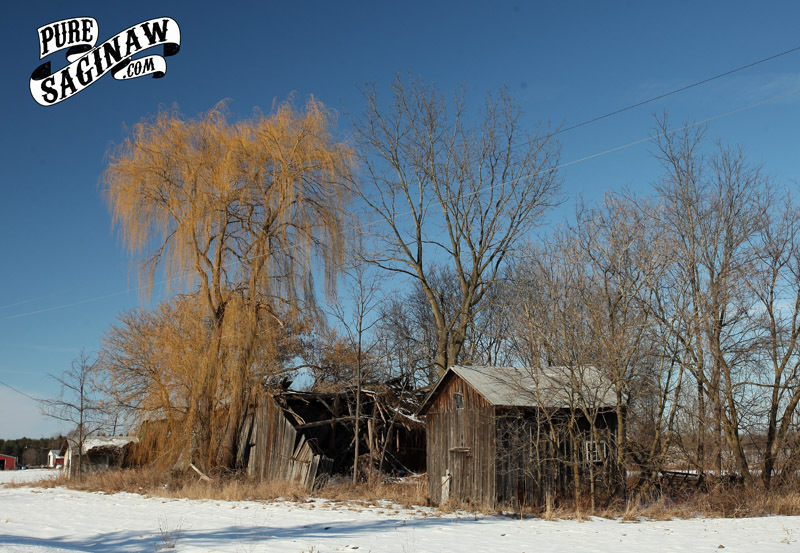 I was out roaming the back roads around Taymouth Township and I came across this old shack and fallen down barn. I can’t imagine what it must have been like back in the old days. When you had to chop wood for heat and if you needed to go to the bathroom in the middle of the night you had to make a trip to the outhouse in the arctic Michigan winter. I find it a hardship when the internet is out, I don’t know how anyone survived before modern technology. 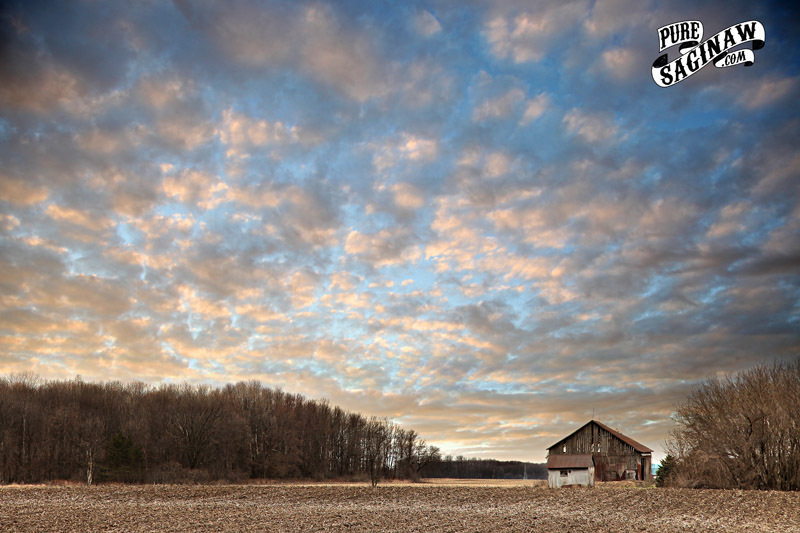 I was out roaming in farm country a while back and I saw this old barn out near Hemlock and I stopped the get a pic of it. I like the old tile silo. Like many old silos, I see it’s missing its roof. they must not last in the harsh Michigan winter. I hope you will sign up for email updates, You may miss my posts in your Facebook Newsfeed. On the corner of Alicia and Bishop roads was the town of Alicia and it was the largest town in the Praire Farms ( check out my post about the farm HERE). It was named after William Lewis Claus’s oldest daughter. 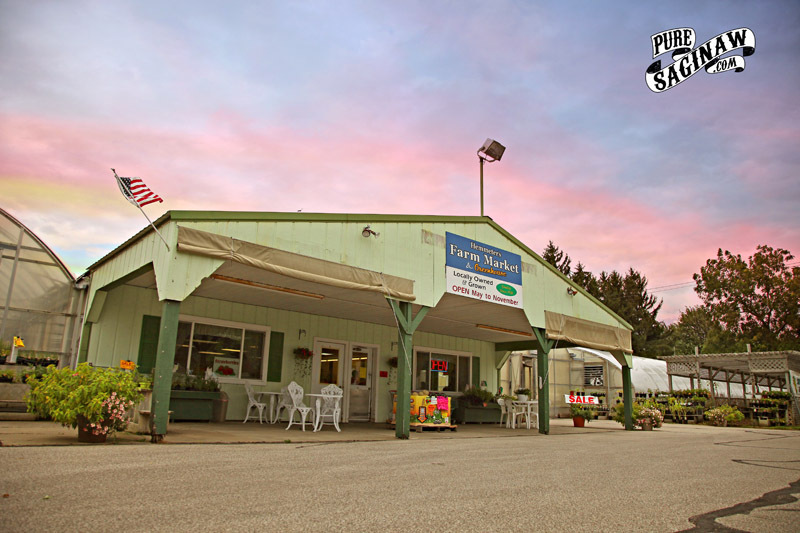 Mr. Claus was the chairman of the board of Pittsburgh Plate Glass who owned the Prairie Farm, and town was where most of the hired workers and their foremen lived. 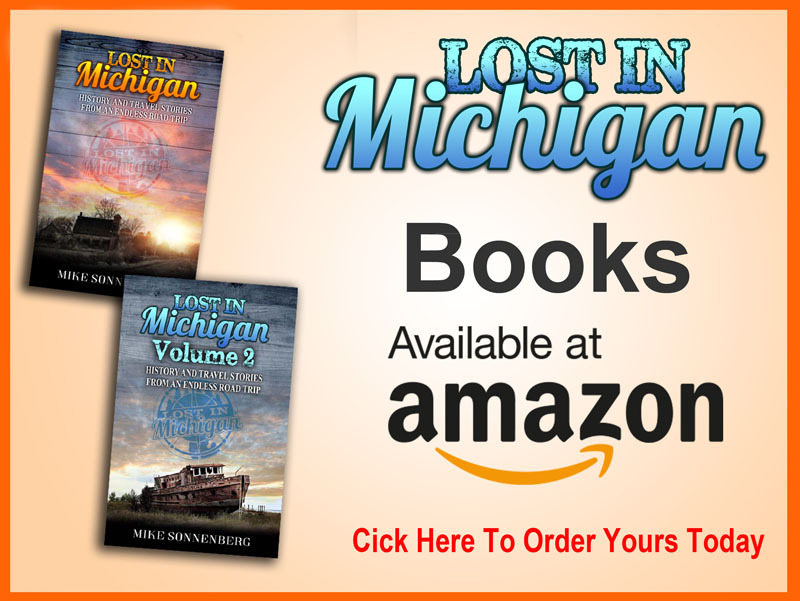 A generator and water plant provided electricity and water to the town that included 80 yellow framed cottages, a general store, a boarding house, dance hall, and several large barns and other buildings for machinery and wagons. A large grain elevator and mint distillery was situated on a spur track connecting the farm with the railroad six miles away. The population would grow to about 350 workers in the summer, and then about 75 in the winter. The post office opened in 1904 and closed in 1947. When I made a trip out to where the town was, I found some modern houses and this old barn, I am not sure if it was used during the time that Prairie Farms operated, but it was the main feature in the area and I had to get a pic of it. 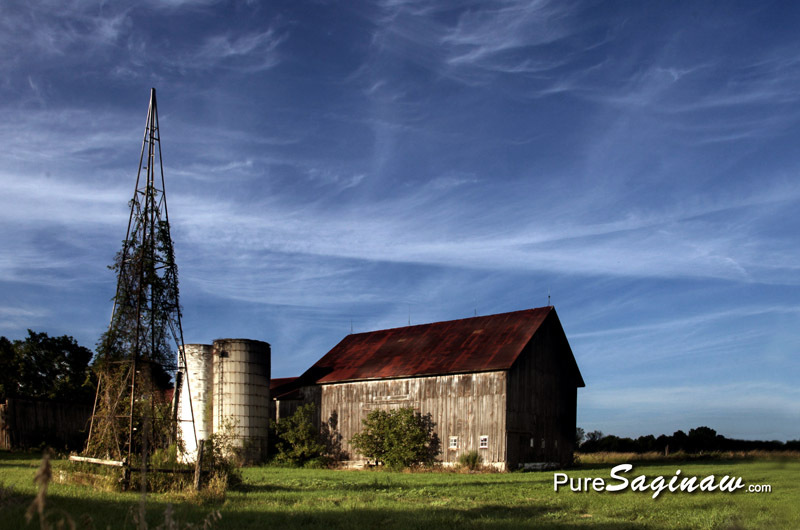 I took a photo of this old barn, on Midland Road near Gratiot, a few years ago, back when I started Pure Saginaw. Driving past there recently, the barn is no longer there, and it’s just a field. 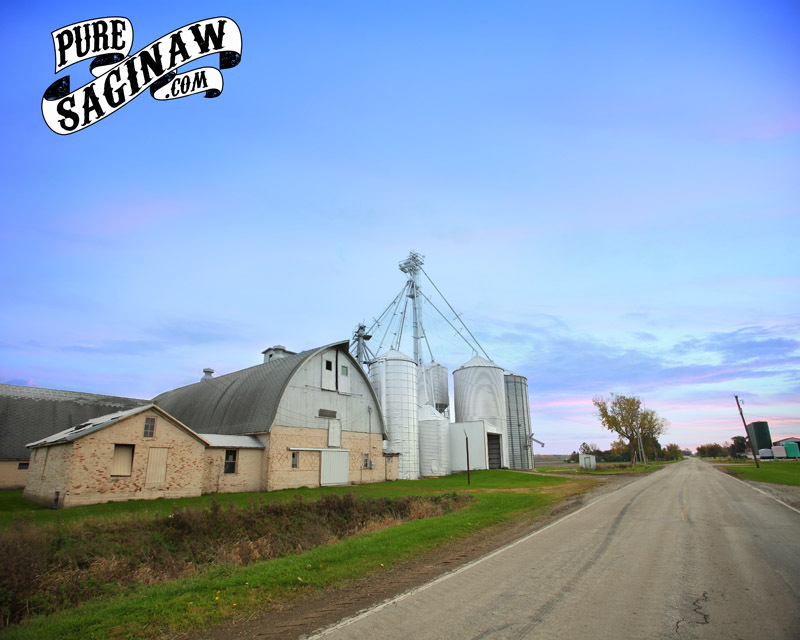 I remember when I was a kid there were a lot of barns and farms around Saginaw, especially along Tittibawassee Road. I guess times change, but I do miss the old barn. 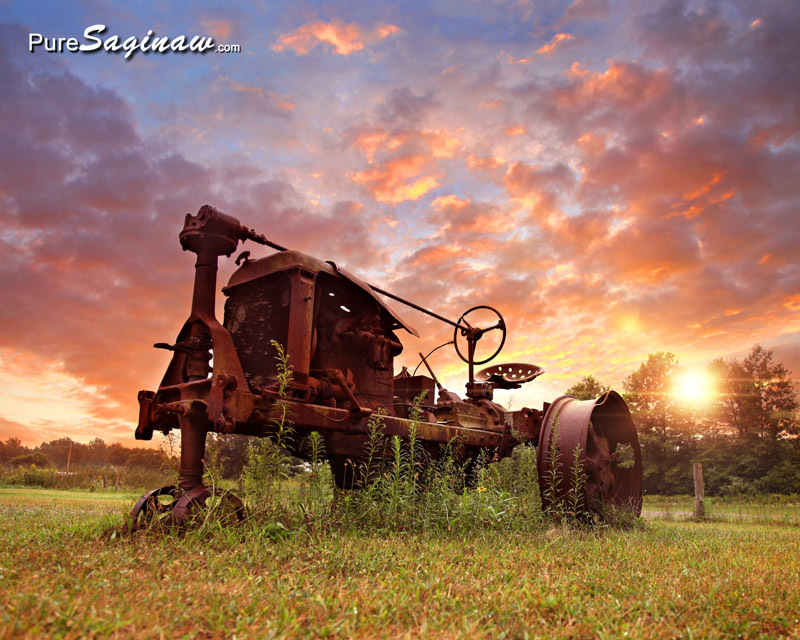 This is the old tractor at the Murphy Farm, in St Charles, that’s part of the Hartley Nature Center. I thought I would post a pic of it just because I like it. I don’t have a story or anything to go with it, so I want to take this moment just to say THANK YOU for reading my posts and subscribing to my emails, and all your likes and comments, it really means a lot to me that you take time from your busy day to read what I write, even if sometimes my writing “ain’t to good”. 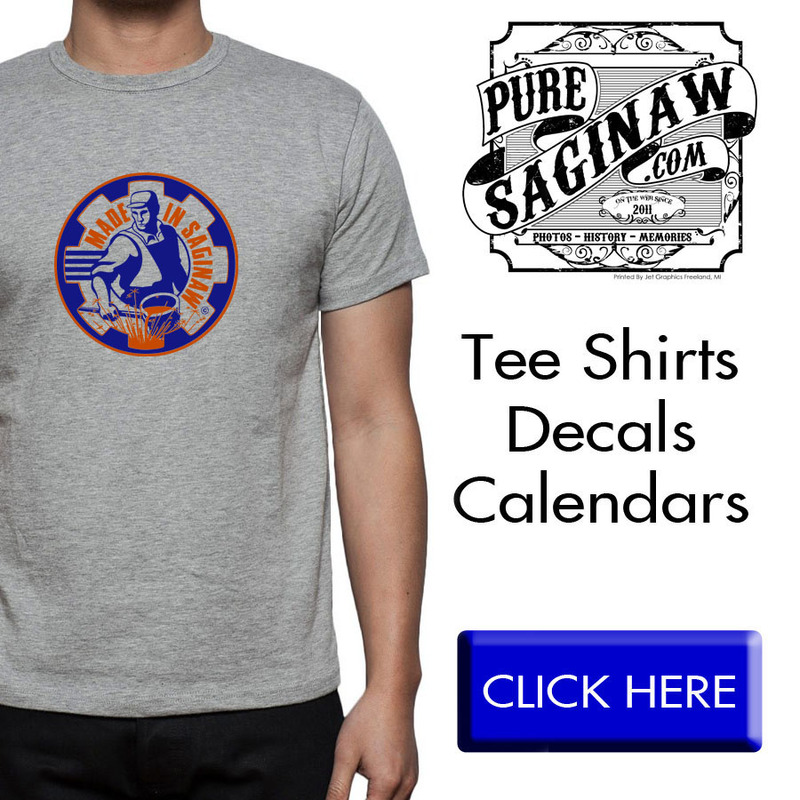 I also want to thank everyone that got a shirt from me this past week while they were on sale. you have no idea of how much I appreciate the help in doing this website. after loosing my job a few years ago I would never imagine I would be doing what I am today if it was not for your help. For those of you that have been following me for a while you know that I don’t like the summer heat, but the one thing that I do like this time of year, is the locally grown sweet corn. I am a city kid, and not an expert on growing corn, but I do know I like fresh sweet corn. Alton Brown said that corn looses it’s sweet flavor the longer it sits after it has been cut from the stalk, and I know at Hemmeter’s they cut their corn fresh, one of the workers told me they cut it a few times a day as they need it, so it’s always fresh, maybe that is why it tastes so good. Mt favorite is the peaches and cream variety, not sure if it is any different than the yellow, but I like to think so. I liked this old barn on Lanwndale with the American Flag proudly displayed on the side of it. 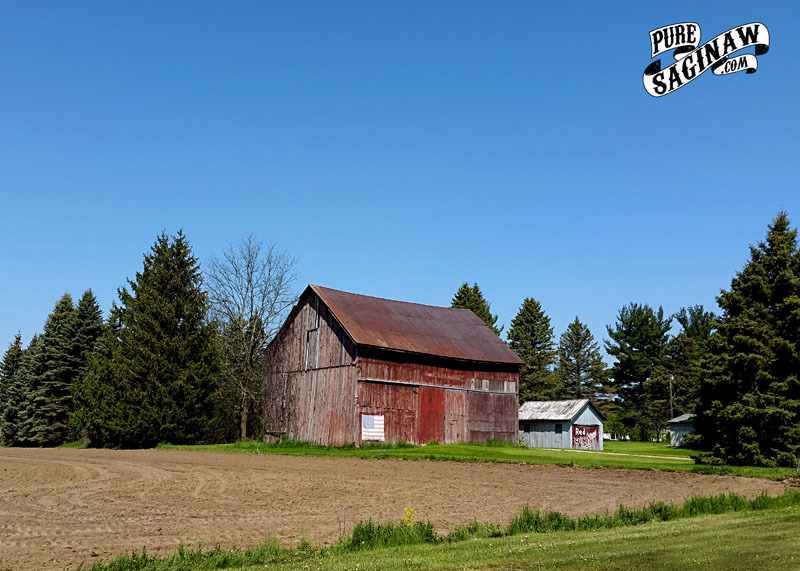 When I was a kid growing up I remember a lot of old barns around the north west part of Saginaw Township and Kochville Twp. 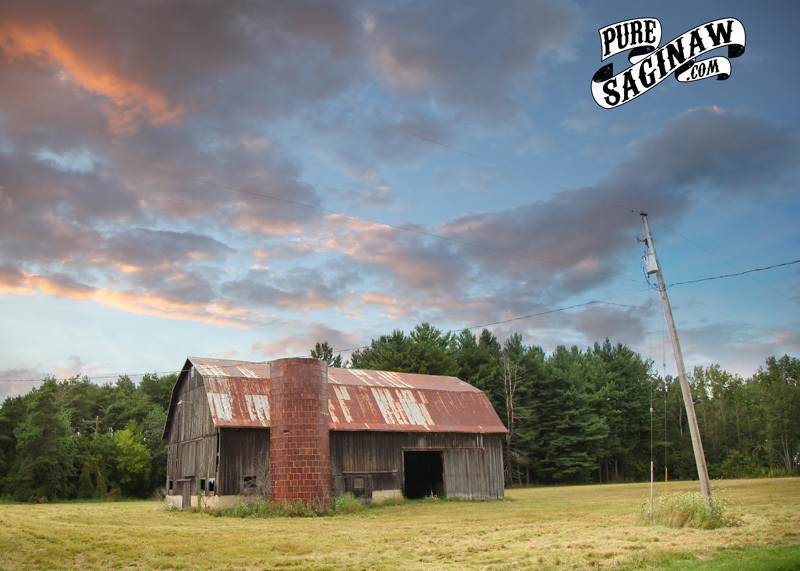 I still remember the old barn near Applebees on Tittabawasse Rd. yeah I know I am not as old as some of you, but I do remember when everything north of Tittibawassee road was all farmland. I guess that’s why I like the old barns left around some of the houses that have taken over the farmland. I saw this old windmill on Kochville road a while ago, but I never found the right time to stop and take a pic of it. I was heading home from work in the snowstorm and I remembered the old windmill. It looks like one of the blades is missing, so the “heavy end” keeps it from spinning, and even if it did, I am not sure it would be doing much work, being old and heavy at one end. ( kinda like me). 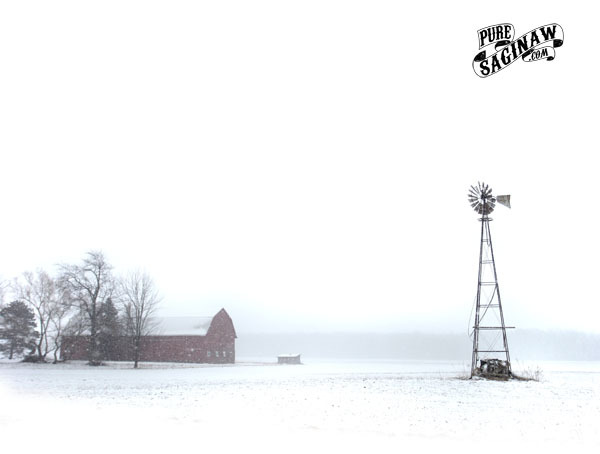 At least it’s still standing tall through the snowstorm, and I can only imagine all the Michigan winters it has seen. It was another beautiful February day in Michigan, but once again a winter storm is predicted for tomorrow and Thursday. I have seen forecasts saying we are going to get over 12″ of snow. I have lived here long enough to know that just about anything can happen, so I don’t put a lot of faith in snow predictions, but it does look like a storm is a brewing. I saw this old barn out near Freeland, and it will be doing all it can to survive another storm. Hopefully I can get out and get some good pics of the snow if we get some. Whatever happens, stay safe and warm.